Obviously, I hadn't planned on being gone from my Blog for over a year. If I had, I would have posted something to that effect. Instead, life got very busy. Trying to deal with Pete's behavior problems, trying to deal with my depression, trying to fight past constant fear that the apartment complex will kick me out. And, honestly, my blog was the least important thing out of all the things I had going on. I could put up short comments on Facebook to communicate. It felt better for me that way. But now, a lot of things are coming together. We've found out what's wrong with Pete (Sensory Perception Disorder - and more on him in a later post). I've gotten back on my meds. I've made a plan to keep myself a bit more organized so I have time to have fun AND get things done. I've started exercising with a Couch 2 5K program. I'm following FlyLady again. I'm giving myself permission to not be perfect. And, most importantly, both kids will be back in school starting August 6. I'm not sure if I'll be able to get back to daily blogging, especially not before the kids start back to school. But I am hoping that I'll be able to post at least once or twice a week. I've got a lot of things on my mind that I want to write about, and I'm feeling like I have the time for it. So, if anyone is out there and actually still reading this blog, look out for more posts in the nearish future. Because I'm glad to be back. 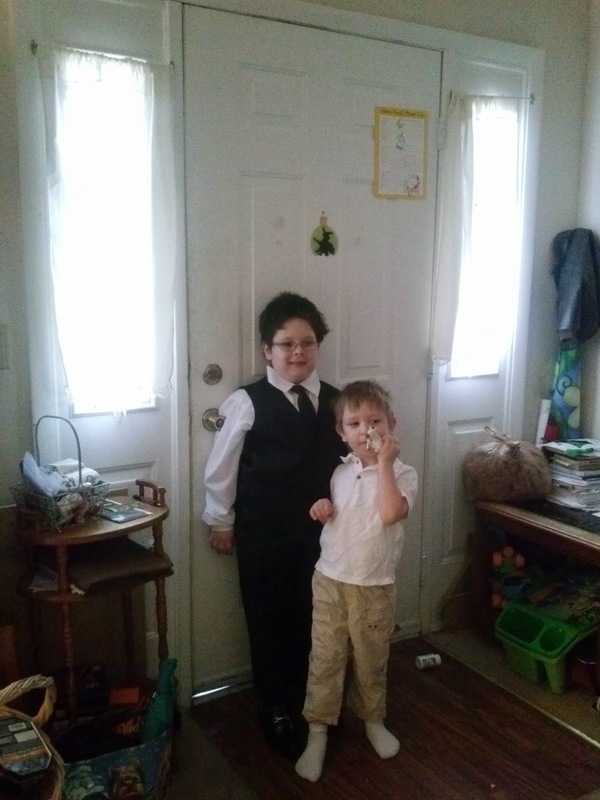 One of the big things that happened over this year was Teddy having his First Communion My handsome boys.